1. 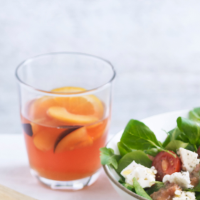 Combine the plums, apricots, sugar, orange juice, orange slices and rosé in a large jug. Cover and chill for up to 6 hours, until needed. Just before serving, top up with sparkling water and ladle into glasses. Garnish each with a mint sprig.